As I mentioned the other day, a huge new stack of Tiger Tales Books arrived on our doorstep last week and the kids and I made pretty quick work of going through and selected our favorites to share with you all. In the last post, we took a look at books for babies and this time we're here to share four of our favorite of their new pictures and present you with an opportunity to win two of your choosing. Jack and the Jelly Bean Stalk , by Rachael Mortimer is a twist on ye olde Jack and the Beanstalk story. Jack and his mother live alone and are in need of some money. Jack's mother sends him to sell the family cow, which he does. However, instead of bringing his mother back the money that he made from selling the cow, Jack stops by the candy store and buys a bag full of magical jelly beans. The story generally flows along in the same familiar manner except that everyone eats a lot of jelly beans without falling into a diabetic coma which does indeed prove to me that they are of a magical variety. My boys (especially the five year old) were the most interested in this story. Mommy's Little Sunflowers is just one adorable book from beginning to end. 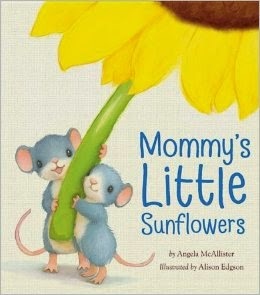 Written by Angela McAllister and illustrated by Alison Edgson this book tells us the story of two little mice who plan to grow sunflowers for their mommy. They have some difficulty in the collecting and planting of seeds but they finally manage to get the work done. They are disappointed to discover that a lot of time, a lot of sun, and a lot of rain are involved in the growing of said sunflowers. Mama dries some tears only to discover a sneaky little plan that the two mice have in turning THEMSELVES into sunflowers! And what cute little mice sunflowers they are! This title is a winner and my personal favorite. We Love You, Hugless Douglas! is the latest in the Huglass Douglas series by David Melling. My boys were excited to see this title come out of the box because they have really gotten a kick out of the other HD books. In this new story, HD is helping some friends find one another. After he has reunited the two, he begins to feel a little lonely. He realizes that he doesn't have a best friend but he sure thinks it would be nice to have one! In the end, he realizes he has a lot more friends than he originally believed. My boys didn't think this title was quite so funny as some of the others but neither were they disappointed by it. It's Hugless Douglas and that was enough for a fun read. 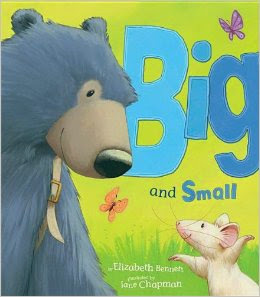 So here are our top four favorite picture books from the new Spring line-up. 2. Which two titles you'd care to win if your name is selected as the winner. THIS CONTEST IS NOW CLOSED. THE WINNER (as selected by random.org is #5 - *Carrie* CONGRATS! Many thanks to Tiger Tales Books for sending copies of the above titles in order to facilitate this review. I received no additional compensation for this post and all opinions are 100% my own! Well, I'd love to win, but my constant state of being itinerant (and outside the US) makes that difficult! :) So, I'll just make a note of these in case I come across them. 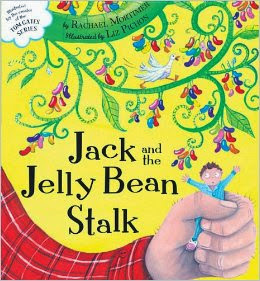 I can see Jack and the Jelly Bean Stalk being a favorite around here. After that, it's a toss up between the sunflower book and hugless. I'm from Kansas so would love Mommy's Little Sunflowers. 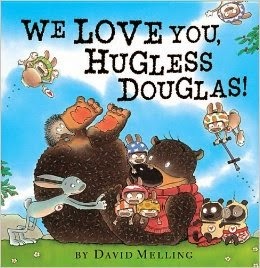 My son's middle name is Douglas named for my dad- so I would love Hugless Douglas! Thank you! Fun books--I always like Jane Chapman's illustrations, so I would probably pick that one and the sunflower one. OH! The sunflower one looks adorable! :) And Jelly Bean Stalk would be my second choice I think. I was a little disappointed that there wasn't a book that *especially* stuck out to Bookworm 1. After I saw 2 year old then 5 year old then mommy, I thought for sure that Bookworm 1 would be next -but, alas. I would love to win Big and Small and Mommy's Little Sunflowers for my daughter. These books are so cute. Thanks for having the giveaway. I'd love to win Mommy's Little Sunflowers and the Hugless Douglas one. :) Thanks for the chance! These books look so sweet and fun to read. I would choose Mommy's little sunflower and Big and Small. But they all look great! Not sure if this is too late, but I'd choose Jack and the Jelly Bean Stalk and Mommy's Little Sunflowers.